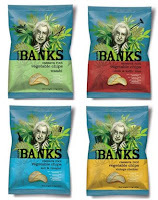 The Joseph Banks cassava root chips are aimed at health conscious consumers. They are low in fat, gluten free and cholesterol free. Here are some recipes that are a light, low carb accompaniment to Joseph Banks chips. Beat the cheese with a wooden spoon and gradually add the milk until the mixture is smooth. Stir the onion garlic and watercress into the cheese. Leave for at least 2 hours in the fridge to allow the flavours to infuse. Season and serve with Joseph Banksvegetable chips. l medium onion, skinned and finely chopped. 142ml or 5 fl.oz soured cream. Serve with Joseph Banks vegetable chips. Finely chop tomatoes, onion and garlic clove, Combine the ingredients and chill in the fridge.